The benefits of an upper body ergometer do not just come down to a vanity play of getting a little arm candy, it also comes down to overall health. That’s why upper body ergometers (UBE) are so widely used by elite athletes and sports teams. So, the next time you use Excy to tone your upper body, make sure to think about the wonderful benefits of moving your shoulder joints, firing your core stabilizing muscles, and getting some upper body conditioning. In today’s live streaming challenge, we explored using Excy for bicep curls and it’s a heck of a lot more fun than dumbbell weights. Here’s Today’s Excy Upper Body Workout! Motion is lotion and your upper body needs to move after your arms likely spent too much time in a Tyrannosaurus Rex position during the morning commute, hands on a keyboard at a desk, and then on your cell phone. 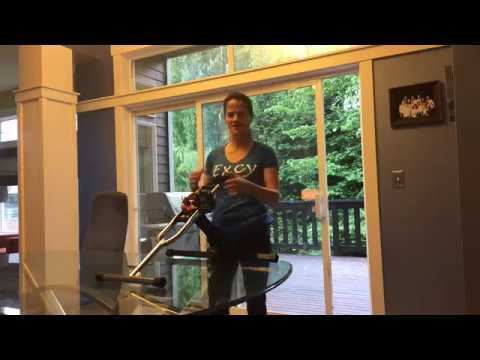 Explore All the Ways You Can Use Excy for Upper Body Workouts! Don’t forget you can also explore upper body cycling with a leg injury and Excy is an amazing aerobic, anaerobic, and range of motion exercise too! According to Joseph Warpeha’s article “Upper Body Ergometry: The Most Underused Aerobic Exercise” in the National Strength and Conditioning Association’s “Performance Training Journal,” you’ll experience a more substantial rise in your blood pressure during an upper-body aerobic workout when compared to a lower-body aerobic workout.